Michael Desmond, a Frank Lloyd Wright scholar and member of the Frank Lloyd Wright Foundation’s Board of Trustees, highlights the influence of Japanese art on Wright’s understanding of the world around him by pairing the art with Wright’s writing on the topic. To highlight the influence of this art on Wright’s understanding of the world around him, I have paired selected passages from The Japanese Print with examples from his own art collection exploring the insights revealed in his writings. This article originally appeared in, “Section,” the Summer 2017 issue of the Frank Lloyd Wright Quarterly. ORDER: “A bridge over a river with Mount Fuji in the background” by Shinsai. STRUCTURE: “A view of Mount Fuji” by Hokusai. SIMPLIFICATION: “A pair of Chinese pheasants” by Kubo Shumman. NATURAL SIMPLICITY: “A branch of plum blossoms” by Toshu. SCIENTIFIC ELEMENTS: “A lacquer bowl and cover with noodles and other ingredients” by Hokuba. Michael Desmond is a licensed architect, holds a Ph.D. in the History, Theory & Criticism of Architecture from MIT, and a Master of Architecture in Urban Design from Harvard University. Having taught at Harvard, the Boston Architectural Center, the Rhode Island School of Design, and the University of Massachusetts before arriving in Baton Rouge, Desmond now teaches architectural history and urban design in the Louisiana State University School of Architecture. Long‑term research interests include study of the form and processes of urban growth in the United States; relationships and dependencies between architectural forms and urban planning ideas; and the ways in which buildings and the patterns of towns are expressive of underlying cultural ideals. Desmond, a Frank Lloyd Wright scholar, serves on the Frank Lloyd Wright Foundation’s Board of Trustees. 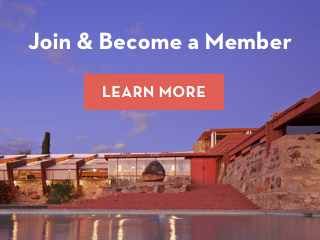 During the cold winter months, when tours were closed to the public at Taliesin in Spring Green, Wisconsin, the Frank Lloyd Wright Foundation and sister organization, Taliesin Preservation, partnered to complete a project that is set to be a major highlight on the tour path in the 2018 season. The following excerpt was originally published in a September 1932 issue of Scholastic magazine, and then in Frank Lloyd Wright Collected Writings, Vol. III, edited by Bruce Brooks Pfeiffer.